Recovery Partners Queensland offers a treatment solution which specifically addresses an injured workers functional restrictions through Exercise Physiology, resulting in a timely return to work following a workplace injury. Recovery Partners Functional Upgrading Program is provided by our accredited Exercise Physiologists who specialise in evidence based exercise prescription for individuals with a workers compensation claim. They are tailored to an individuals deficits and aligned to the physical requirements of their work. By replicating pre-injury work activities in a safe & supervised environment, participants can confidently progress with their return to work plan and resume normal activities in a safe, timely and durable manner. Throughout this delivery, we focus on our patients capacity and employ strategies to reduce a “disability” mindset. Programs are typically 6-12 weeks in duration and can occur in a home, community based (gym) setting or the workplace. Recovery Partners is a registered treatment provider with WorkCover Queensland and operate with no gap payments above WorkCovers gazetted rates. Key communication points with updates provided upon commencement, mid-program & following the final assessment. This can assist the general practitioner to confidently progress the workers medical certification immediately after the initial assessment and at each review point. Assists the employer to assign medically appropriate work duties which best support timely rehabilitation over the course of the intervention. 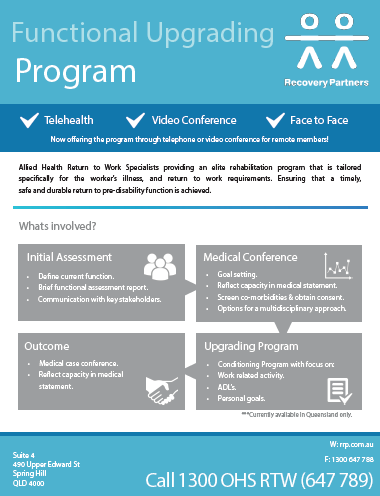 Where appropriate, our team of allied health professionals can engage in medical case conferencing to drive outcomes and best support a patients progression. Recognises that rehabilitation must consider far more than just the medical management of a specific injury. We screen for psychosocial factors which may act to prevent or delay a timely recovery & return to suitable employment. Early identification of psychosocial flags can allow key stakeholders to address non-medical barriers in a timely manner.